Patterns of eating and snacking behaviour have changed significantly over the past 40 years. One US study showed there are only five hours during a 24-hour period (between 1 and 6 am) that food is not regularly consumed. Yet frequent snacking or continuous grazing between meals has now been linked with obesity, elevated blood cholesterol, blood pressure and insulin resistance, fuelling chronic disease. Your body is designed to run on a 24-hour internal clock that regulates all processes. While the master clock is located in your brain and calibrated by light, you also have more than 20 other clocks in various organs, including your gut and liver, which are additionally responsive when you eat. In mice, food given during normal sleeping time, or over extended periods, can uncouple these other body clocks from the master clock, resulting in disruption of multiple pathways in different organs, increasing vulnerability to disease. However, a study from California’s Salk Institute for Biological Studies shows it is possible to restore normal clock regulation, at least in mice, by restricting feeding to an 8-hour period during the 24 hours. Despite testing various unhealthy diets, without any calorie restriction, the time-restricted feeding protected these mice against weight gain, reduced inflammation and restored their ability to control blood cholesterol and glucose levels. Recent discoveries tell us the timing of food intake is more important than once thought. While regular fasting is associated with less diabetes, cancer, heart disease and brain shrinkage, we now know that even just eating the same amount of food (calories) but in a restricted part of the day can also provide dramatic benefits for metabolic health. The take-home message? Limit eating to a narrower time period during the day. Fast between your meals—drink water only. 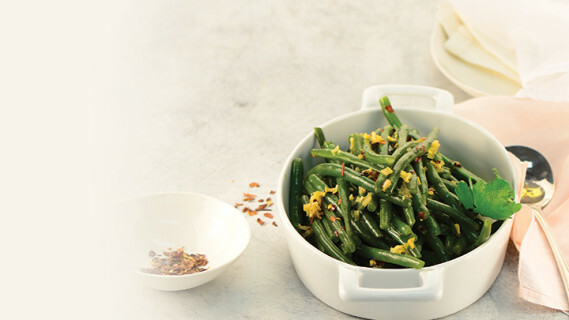 A delicious and easy way to enjoy tenderly cooked green beans as a vegetable side dish. Steam beans for about 15 minutes until tender. Rinse with cold water to stop the cooking process and drain. Meanwhile, gently warm the oil in a small pan and fry the garlic and chilli for just 30 seconds. Remove from heat to prevent burning. Place beans into a serving bowl. Add the oil mixture and vinegar and toss until well coated. Serve immediately while warm or refrigerate and enjoy chilled. PER SERVE: energy 553 kJ (132 cal); protein 2g; fat 12g; saturated fat 2g; cholesterol 0mg; carbohydrate 3g; fibre 4g; calcium 45mg; iron 1.0mg; sodium 3mg.